PHOTO CAPTIONS: 1. Sunset at Hotel du Village beach, 2. 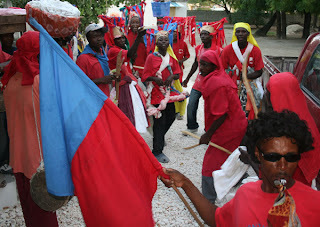 Arriving from Les Cayes by moto-taxi, 3. Every day is market day, 4. 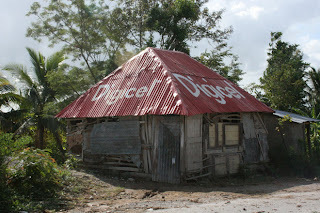 Digicel ads are everywhere. I wonder if they provide the roofs for huts like this, 5. Port Salut Beach, 6. 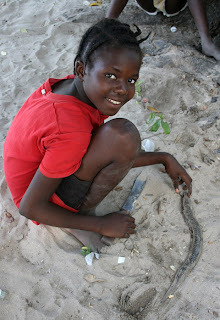 I spotted this girl preparing eel, 7. After negotiating a price, the frying begins, 8. 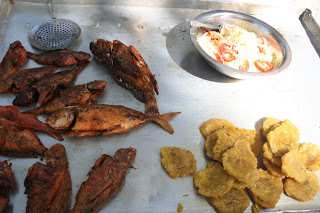 We also ordered a fish, fried bananas, and salad, 9. Having fun back at the hotel beach, 10-11. 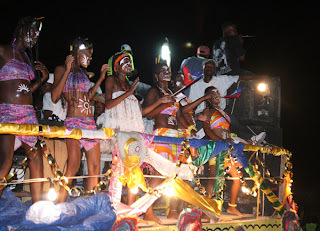 Carnival was celebrated during the day and at night, 12. Breakfast at the hotel, 13. Port Salut is still undiscovered by foreign tourists, 14. 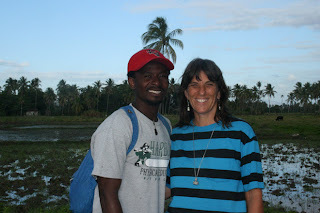 Outside Les Cayes at the rice fields, 15. A new friend asks to be photographed. 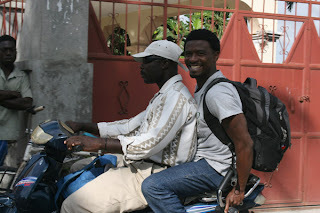 We planned on riding in a tap-tap from Les Cayes to Port Salut. But we got weird vibes from the other male passengers waiting in the back of the truck. When the driver told us he wouldn’t be leaving for another three hours, we took the hint and left. We decided to splurge on two motorcycle taxis for the hour-long ride. As it turns out, the ride was excellent, partly due to the Taiwanese-built road. The scenery between Les Cayes and Port Salut is stunning. As we climbed the hills, I caught glimpses of the coast. 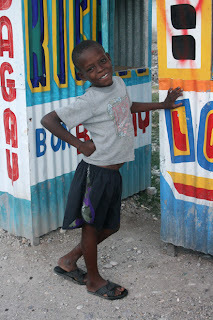 Passing small villages, you see what everyday life in Haiti is like. Sadly, the trees have been cut down in many places, mostly to be made into charcoal for cooking, but it’s still possible to see how beautiful Haiti was and could be again. Port Salut, population 10,000 has a few hotels. 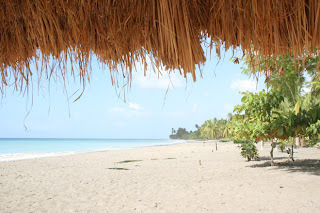 We chose Hotel du Village, which features 9 little cottages right on the beach. The clean, nicely decorated rooms are pretty basic with no hot water, no electricity during the day and no internet. A delightful French woman named Catherine owns the place. 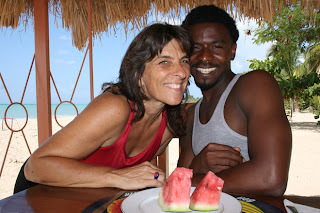 I liked how she embraces the Haitian culture and community. We saw her give donations to the Carnival processions, speak respectfully to her employees, and one morning she treated a young man’s wound. Originally, she came to Haiti as a volunteer nurse. 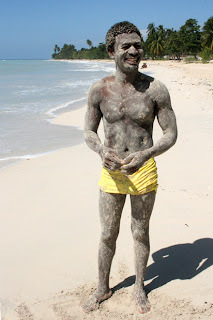 Our beach was right out of the tourist brochures, with white sand, warm sun, clear water, and very little garbage. Most of the time we were the only ones there. When we wanted company, we just walked 5-minutes away to the public beach. School was out for five days for Carnival, so the place was packed. 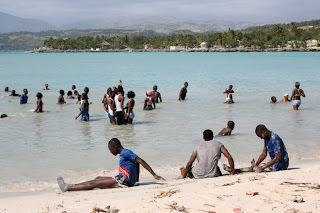 The funny thing about Haitians, is most of them don’t swim and they’re terrified of the ocean. 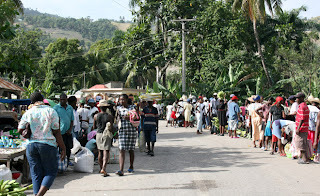 Unlike Americans, who spread out in the water, the Haitians tend to cram into one small area. Until recently, Andre couldn’t swim and was terrified of sharks. I guess it comes from living in a country so poor that people risk their lives on overcrowded fishing boats, trying to make it to the U.S. Many end up drowning or being eaten by sharks. But since Andre met me, he’s learning how to swim. I predict he’ll actually be a strong swimmer once he gets lessons in Santa Cruz. Our second day at the public beach, I was surprised to see several carloads of white people show up. They’re Americans from a group called Healing Hands for Haiti who do volunteer medical work, mostly with children. While Andre played soccer with their interpreter and local co-workers, I chatted with a clown named Paul. He entertains the kids with soap bubbles and Chinese juggling sticks, to warm them up for the doctors. Paul claimed that most Haitians are terrified of doctors because they only see them when they’re dying. Sure enough, before long, Paul was entertaining a group of curious kids who gathered to see the “blanc” or whites. 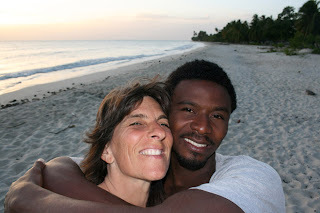 Andre and I could easily have stayed longer in Port Salut, but his cousin back in Les Cayes wanted us to spend her day off with her on Feb. 6th, the day before our flight back to Port-au-Prince. After the beautiful beaches in Port Salut, it was hard to get excited about Plage Jolie, but it was nice to spend more time with Andre’s new relatives. 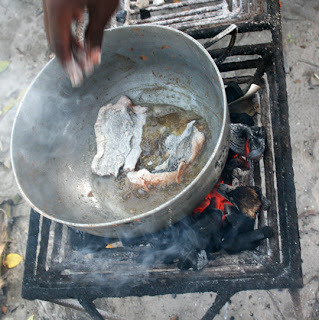 We invited them to fish dinners, which as always, took an hour or more to prepare, but were well worth the wait.